Primarily Blues, Greens & Purple shades & tints. 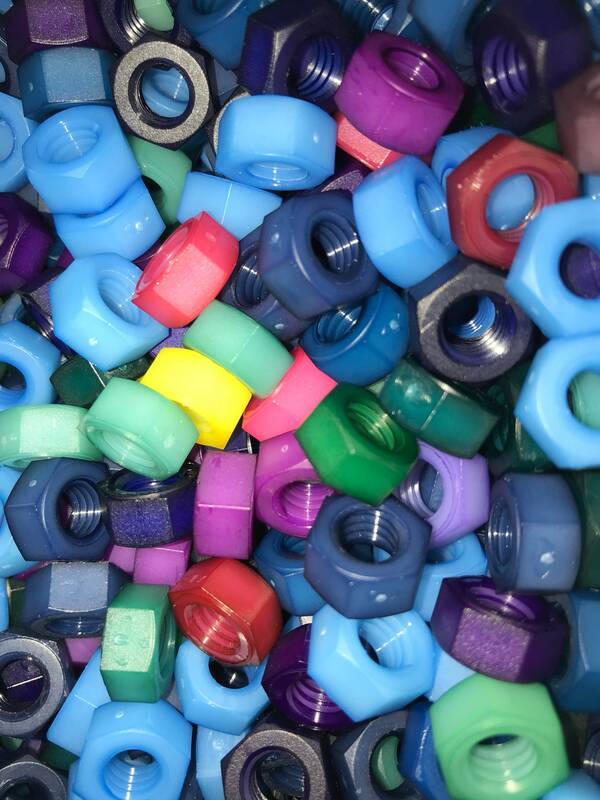 Buying (1) = qty of 100 Colored Nylon Odds, Seconds & mis-matched Greens, Purples, Blues, Reds, Pinks, Yellows, & Other unique colored Nylon Hex Nuts; qty 100 grab bag style of the colors shown in the photos. 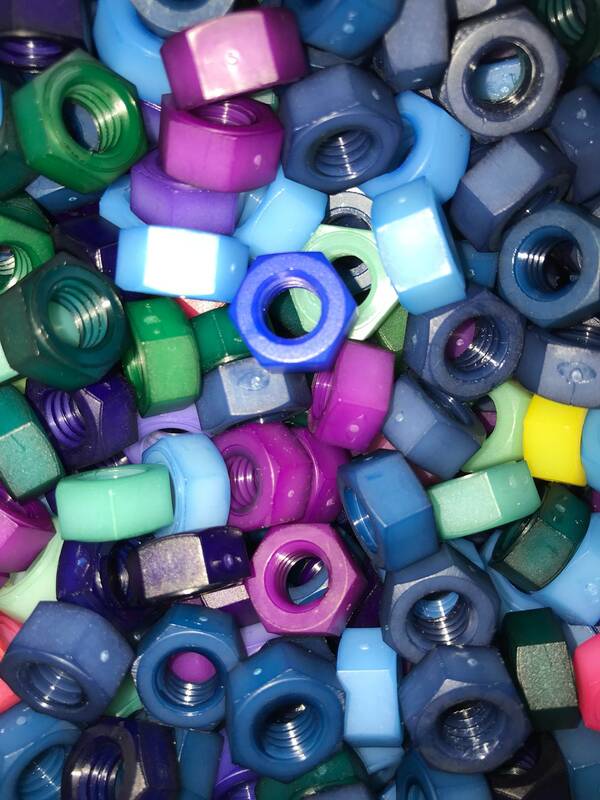 These are Nylon colored 5/16-18 hex nuts in varying levels of shades, tints and color levels of the colors shown and only what is shown. 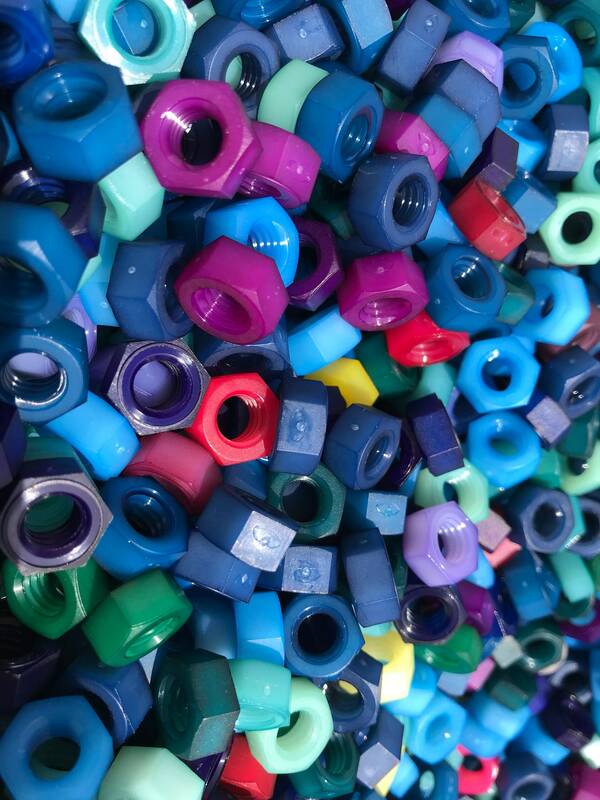 There is no guarantee of any said color matching another of the same color in each batch. 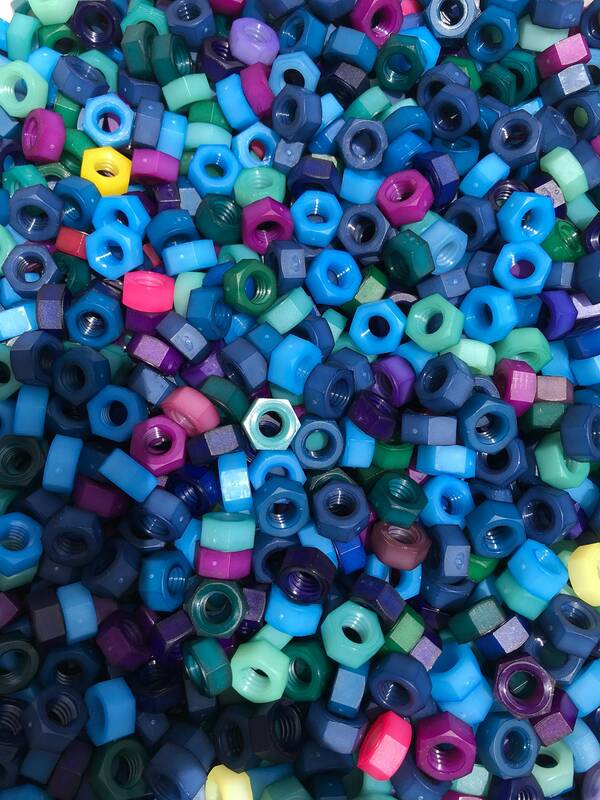 There is no set amount qty of each specific color in the batch of 100 pieces. We will do our best to make sure there are multiple colors as much as possible, but no guarantee of equal qtys in each batch of 100 pieces. This is basically a grab bag style of item being sold. 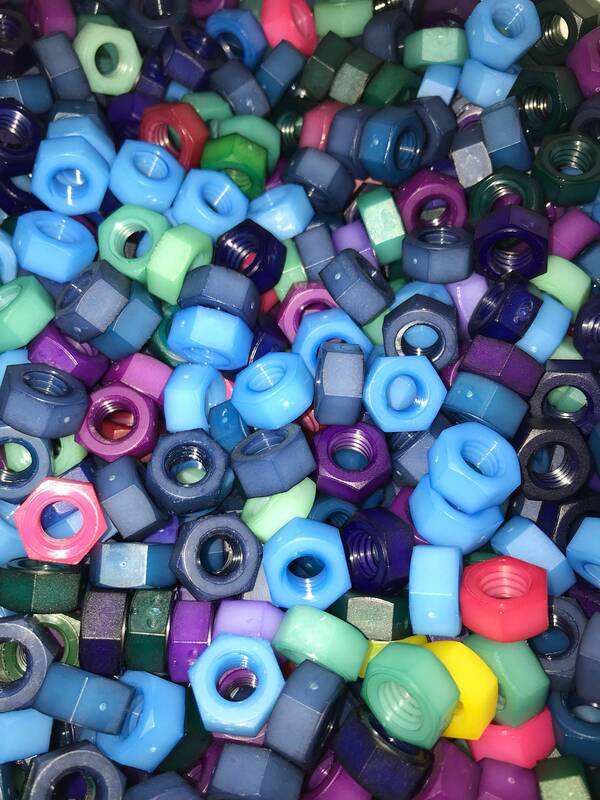 Custom made Tints & shades of Green, Purple, Blue, Red, Yellows & Colored Nylon Hex Nut size 5/16-18. 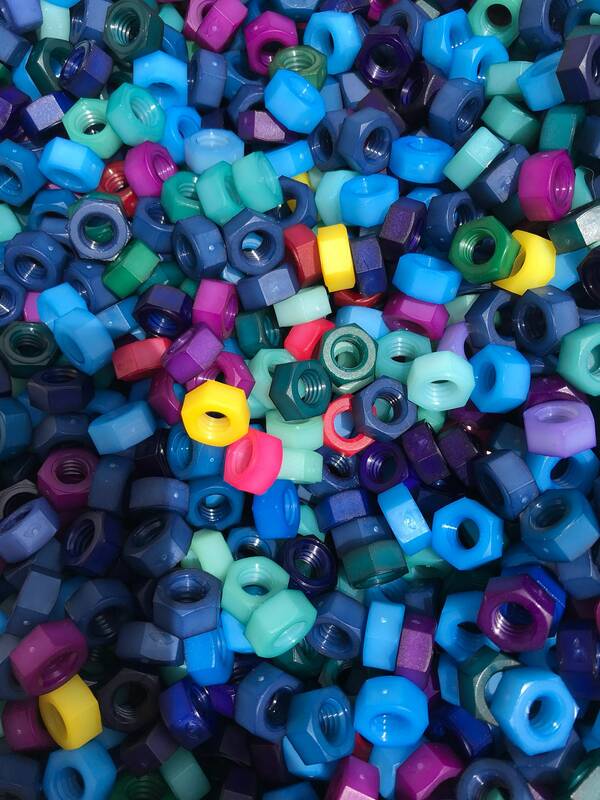 Color matching can be tricky sometimes based on the items raw stock, therefore we have 1000’s of rejects when were Standardizing our basic colors. 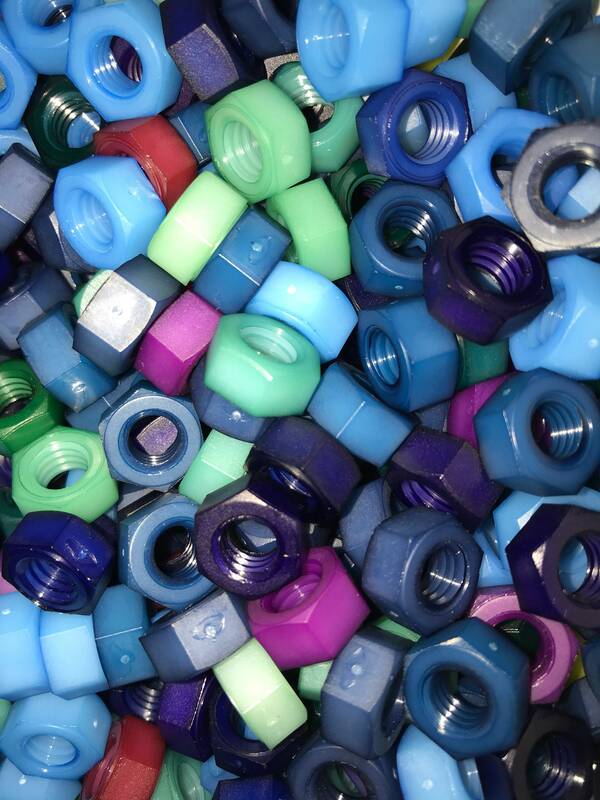 The Nylon Hex Nuts are still in useable condition and if you want a little mix in your color scheme for your craft projects, then this is the item for you! Item is sold in increments of 100 only. If you want 200, choose qty of 2 and for 300 choose qty of 3 and so on. Shipping is $7.50 up to qty 700. Anything higher than that will increase shipping amount. Please send me a message if you want qtys greater than 700 and I will set a custom item up for you showing adjusted shipping costs. 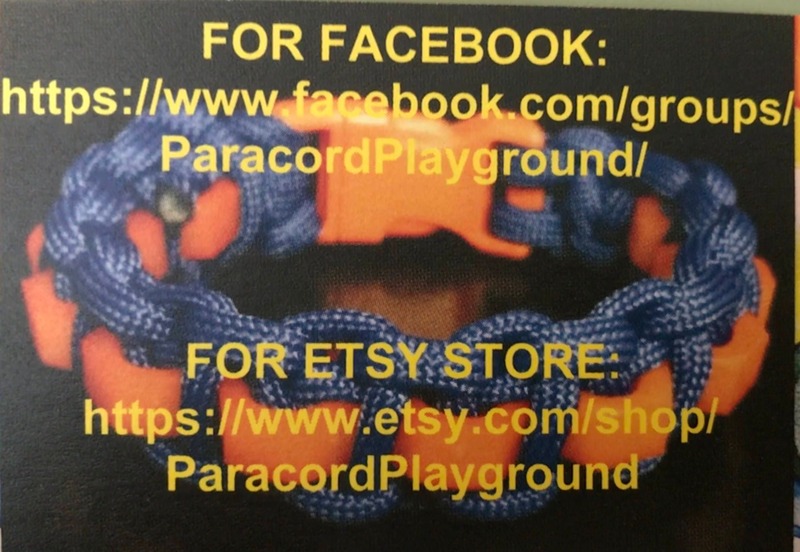 This item has a limited item qty available and when they are sold, that will be all for this item. 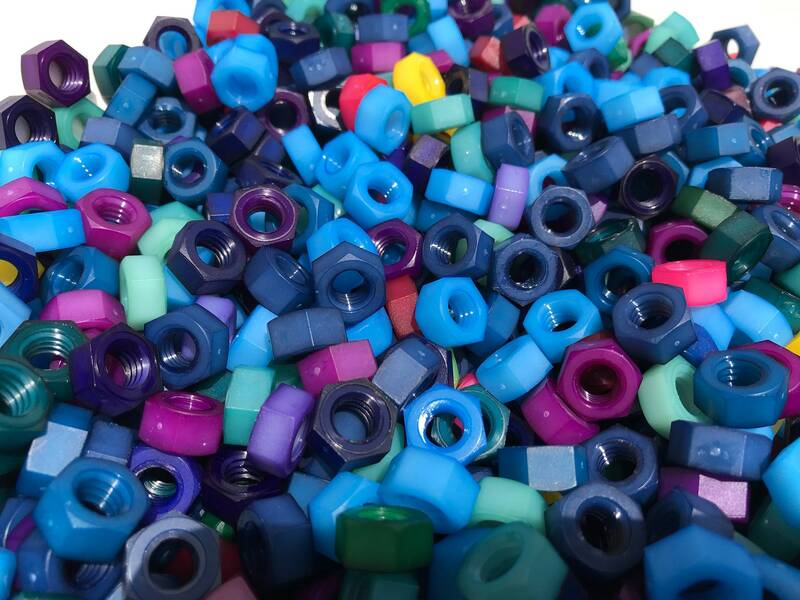 These limited item pieces really fall into a category of failing to meet or match the solid bright color level of our main Nylon Colored Hex Nuts, and that is why they are sold as Grab Bag Style with no matching color guarantees! NOTE: THESE ARE LIGHTER COLORS AND STRONG IN THEIR COLORS. 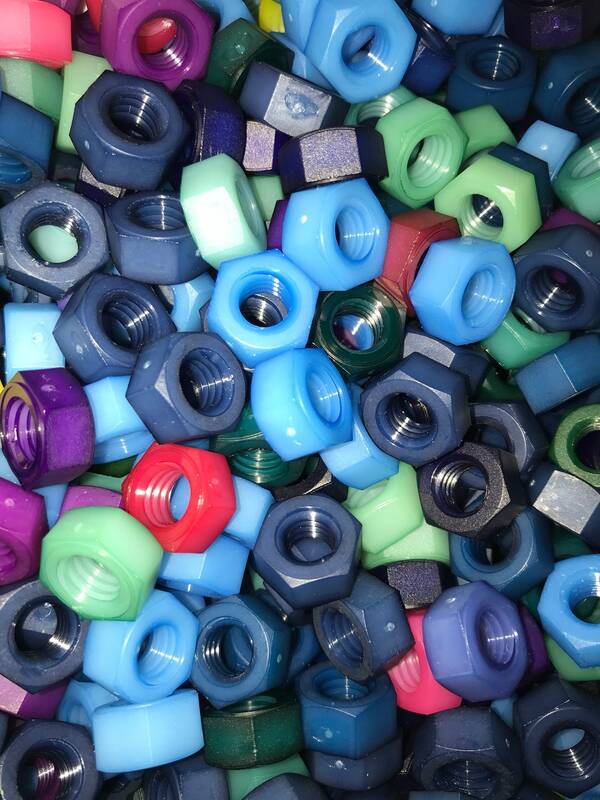 IF YOU ARE LOOKING FOR A MORE CONSISTENT SOLID OR BRIGHTER HUE OR TINT OF THESE COLORS, CHECK OUT OUR OTHER STORE ITEMS OF NYLON HEX NUTS. This item is not eligible for specific notes or message for requesting specific colors and qtys. This item is sold in increments of 100 "Mixed - Mix All" as the only option. NOTE: Ordering qty 1 = 100 pieces and those 100 pieces will all be predominately shades & tints of blues, greens, violets or purples and minimal of all other colors.